Microsoft has been having a good run over the last five years, since Satya Nadella took over the CEO position. There is no doubt that the company is viewed more favorably, both internally and externally, than it was during the tenure of Nadella's predecessors. Microsoft has added nearly $500 billion to its market cap since Nadella moved into the CEO's office. So why isn't he being paid more? Why hasn't he ascended the ranks of the wealthiest people? Bill Gates has a net worth of $96 billion. The company's first CEO, Steve Ballmer, has a net worth of $40 billion. Of course, Nadella is an executive and executives don't usually become billionaires without founding a company or being CEO of a major company for more than a decade, like JPMorgan Chase CEO Jamie Dimon, who has been CEO since 2005. He became a billionaire in 2015. Dimon's annual salary is $27.5 million and he has a net worth of $1 billion. Nadella's salary is $20 million, and he has a net worth of $120 million. Nadella was born in India in 1967. He got his Bachelor of Engineering in Electronics and Communications from Manipal Institute of Technology. He moved to the United States to get his Master's in Computer Science from the University of Wisconsin, Milwaukee. After that, he got his MBA from the University of Chicago. Nadella started his career at Sun Microsystems. He began his tenure at Microsoft in 1992 when he joined the Windows Developer Relations group as a Program Manager. He quickly moved up through the ranks to Senior Vice President of Research & Development for the Online Services division, and then Vice President of the Microsoft Business Solutions group (MBS). He was promoted to President of the $19 billion Microsoft Server and Tools Business and then Executive Vice President of Microsoft's Cloud and Enterprise group. Nadella is the man responsible for building and running the company's computing platforms, developer tools and cloud services. On February 4, 2014, Nadella was named the third CEO of Microsoft succeeding Bill Gates and Steve Ballmer. Brad Silverberg used to be Nadella's boss. He left Microsoft in 1999 to become a founding partner at venture capital firm, Ignition Partners. He was part of the team that selected Nadella as Gates' replacement. 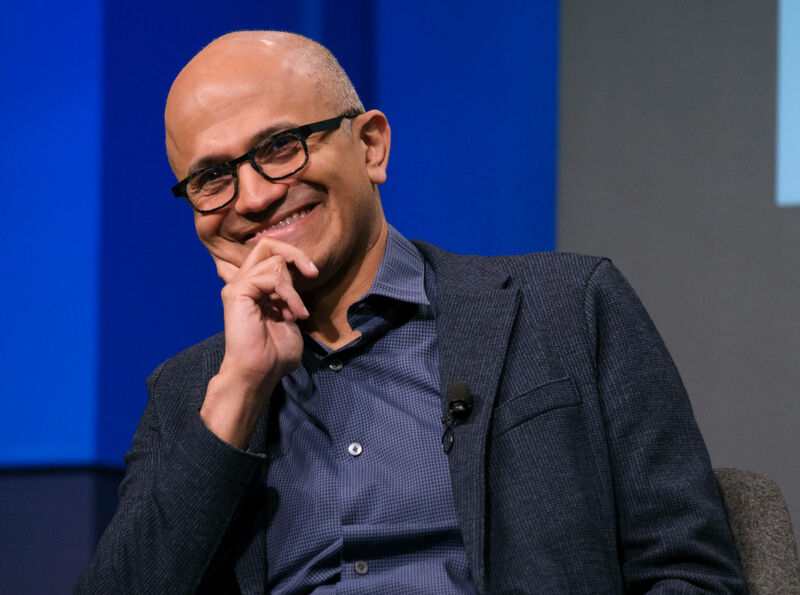 He considered the qualities he remembered about Nadella, mainly that he was humble and recommended strategies in the best interest of the company, not himself. Under Nadella, the internal culture of the company is much improved. People are happy to work there. Investors are also happy. Microsoft's stock is up almost 182% since he took over. Under Nadella, Microsoft has transformed the legacy client-server models and become the leader in cloud across IaaS and SaaS. Nadella is considered a top five CEO but his compensation package does not reflect that. Nadella has taken the CEO job and applied a different viewpoint to the job. In doing that, he improved the processes that were going on. Nadella has changed the course of Microsoft in a fundamental way. Compare that to what Tim Cook has done at Apple, and, well, Nadella looks even more deserving of an additional stock grant to raise his compensation package. Nearly half of Nadella's compensation is based on how he performs on an annual performance review.